There was a time when watching a David Attenborough wildlife documentary was an unalloyed pleasure. Today it’s a little different. The stunning images continue to delight, but the context has changed. Climate change, population growth and pollution are all taking their toll on wildlife. And when the focus is on the world’s oceans, it’s hard not to be depressed at the sheer volume of plastic that is finding its way , not only into the water, but on to the marine food chain. Much of the plastic that ends up in rivers, oceans and landfill sites can be recycled but to some extent that requires a will on the part of consumers around the globe. So the question is – how do you encourage ordinary people to take their plastic to collection centers, or put it into dedicated recycling bins, rather than simply throwing it away without thought? On the face of it, this is a policy issue. For example, governments can discourage the use of plastic products, such as carrier bags, by imposing taxes. But what about the positive side of the equation. How do you actively incentivize citizens to do their bit for the planet? Enter Norwegian startup, Empower. 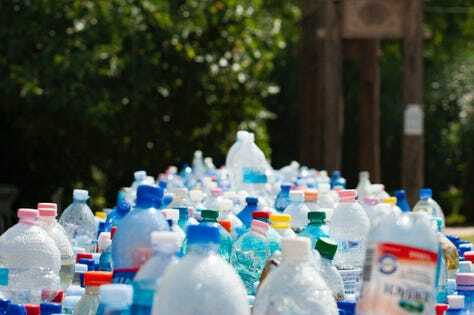 By using a blockchain-enabled system, the company believes it can successfully nudge consumers – and particularly those in emerging markets – towards taking the kind of action that will significantly reduce plastic pollution. Empower founder Wilhelm Myrer acknowledges that the development of a blockchain-based solution to the plastics issue marked a step change in his entrepreneurial progress. Previously, he had been working on alternatives to traditional bank accounts but had not succeeded in convincing backers or users. “We didn’t really come up with a use case,” he say. But following a chance meeting, he was asked by Nordic Ocean Watch if there was any way that blockchain technology could be deployed in service of the organisation’s mission to clean up beaches. Myrer sent founder Simen Knudsen a presentation and after subsequent conversations, the idea for Empower was born. Myrer’s plan was deceptively simple. Around the world there are a range of organisations – NGOs, corporate businesses and even governments – that are prepared to pay for projects to reduce waste. What they require is a way to bring consumers – those who might otherwise simply discard products – on board with their recycling initiatives. Myrer’s answer was to use blockchain solution as a means both to record the waste brought to collection centers and to reward those who gather it. “The blockchain provides our partners with information on how much has been brought in and when, and also rewards those who bring the plastic by issuing tokens,” he says, adding that participants receive the equivalent of $1 for every kilo of waste. And in addition, the information captured by the ledger systems can be fed into supply chains, if and when the waste is sold on. And that is, arguably, the biggest challenge. If Empower and its partners are to make a real impact, then it has to be done to scale. As Myrer sees it, the way forward is to establish partnerships that will provide the facilities to process large quantities of plastic. This year, we have collected about 10 tons of waste,” says Myrer. “Next year, we are targeting 10,000 tons. So the challenge is to get the partners we need.” Ultimately the goal is to claw in 1 million tons a year. A Good Deed In A Wicked World? To date, the company has been funded by bootstrapping, augmented by a 50,000 euro “impact maker” award received at the sustainability-focused Xynteo Exchange summit in Oslo last month. But with just six people on the payroll, it is seeking further funding to scale up. Rewards-driven recycling is not in itself a new idea. In Norway, 97% of plastic bottles are recycled through collection points that return a tax charge that is initially levied on each unit. But Myrer believes that his system is capable of being rolled out – via NGOs and corporations – to otherwise hard-to-reach consumers in emerging markets. If it works, it may provide another example of how blockchain has the potential to change the world in surprisingly non financial ways.